According to its website, Improper Butter is: ‘A range of improperly delicious, Irish flavoured butters that inspire creativity at mealtimes. Lovingly hand-made in the heart of Dublin’. Not wishing to miss an opportunity to put the strap line to the test, I picked up a perfectly-formed Garlic, Chilli and Basil Butter block from the chilled counter at Avoca. I rushed home, griddled a piece of salmon with a knob of Improper Butter et voilà! The whole process took less than 10 minutes (as I’m brave with my salmon) and the sensation was, well, simply sublime. For this working mum, I was totally excited about the possibilities going forward and so I delved deeper into the product on offer and the girls behind the brand! Firstly, if you suffer from high cholesterol, you may want to use this product sparingly but it’s worth it! And, as it’s naturally gluten free, it provides coeliacs with a great alternative product to flavoured foods. 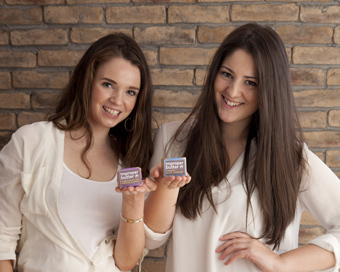 Improper Butter (‘im’ being the Irish word for butter) was the brainchild of Elaine Lavery who quickly joined forces with best friend Hannah O’Reilly to launch their company. The girls met in UCD when they were studying Business & Law and Commerce respectively. Most recently, they secured funding from Irish Dragons, Ramona Nicholas and Eamonn Quinn. I caught up with Elaine and Hannah and first asked them about their product range: “We started in the farmers markets last summer, Elaine came home from France where she was working as a chalet chef, with the idea to retail a product that is being used in restaurants and has been for years and years but nobody is really retailing it. So we decided that we wanted to just get out there with lots of different combinations of flavours and that’s what we did. We went to farmers markets and brought loads of different flavours, sweet and savoury. We had instant consumer feedback and engagement and we were able to hone in on four flavours – Two garlic butter combinations: garlic, flat parsley and lemon, and a garlic, chilli and basil butter; we have a sea salt, chive and black pepper butter and then we have our Cashel blue butter”, states Hannah. As to the competition, “we always said the sauce category because it is the idea of melting a gorgeous flavoured butter onto a piece of fish and it’s your instant sauce that gives beautiful flavour. But really fresh herbs are a direct competitor of ours. It’s great for us because people say ‘I buy fresh herbs and I throw them out because they’ve gone off in the fridge’. This is a way of using fresh herbs that makes them easy, they’re prepared, and it’s done for you. So the fresh herbs and fresh sauces market for us [are the competitors]”, continues Hannah. The duo registered the name under various food categories in Ireland and are in the process of registering a European trademark pending further branding considerations. However, being best friends and now also business partners required them to complete a Shareholders Agreement. “You know people always say ‘you’re best friends and you work in business together what happens if you fall out’? We always say ‘oh there’s the Shareholders Agreement’”, laughs Hannah. Fortunately the girls have access to family expertise on tap and worked their way through various kinds of partnerships and agreements before finalising on one that was in both of their best interests. Initially, the girls see themselves as manufacturers but ultimately they view themselves as marketers who would like to build strong brands of real value. It is helpful that they are naturally attracted to different roles within the business, which are becoming more defined as the business develops. Both entrepreneurs are very much involved in brand ethos. Thereafter, Elaine pays particular attention to the numbers and although Hannah admits “I’m desperate with money”, it becomes evident that our duo complement each other’s strengths and weaknesses. Hannah elaborates: “Elaine and I are both very rational people, we’re very similar in some regards – we’re very different in others… for our future, for the future of Improper Butter and the Improper brand, we are very much on the same page”. Most recently the Improper Team have temporarily expanded their staff and taken on two interns from their UCD alma matter. Ciara and Agnes are 3rd year Food Science Undergraduates and will work with the girls over the coming four months by which time they hope to employ additional manpower. As with any business in its infancy, cashflow is crucial and Elaine acknowledges that suppliers have been very accommodating to their new venture. “It’s important to have a good relationship with the suppliers of our various ingredients. We know them personally so whether it’s a big organisation you know the guys on the ground but you also know the person who’s at the top”. Distribution is key to ultimate product success and with Eamonn Quinn as one of their Dragons, he should be able to lend his experience in this area. Thus far though our duo regard themselves as lucky on this front. “With Improper Butter we have a product that doesn’t have any direct competition in terms of flavoured butters. There are garlic butters and spreads out there. There are ‘own brands’ doing flavoured butters but there’s no single brand that’s doing what we’re doing. So there is a lot of interest from supermarkets, from shops to stock our product and put it on the shelf. In terms of actually getting it onto the shelves, distribution is one of the more difficult questions especially with a chilled product”, says Elaine. Having a product is great but you need to get it out there and social media plays an important part in our duo’s daily business routine. The company saw a spike in their ‘followings’ post their Dragon’s Den appearance. However, in terms of direct sales it’s hard to measure. Elaine acknowledges: “there are plenty of people who buy Improper Butter who aren’t on Twitter, aren’t on Facebook, in fact the majority [aren’t]. However, I think it’s important when it comes to building a brand that you have presence there, that you have following and that people who are on the social media networks know your product because if you’re not there somebody else will be. It’s a great way to build a tone and a brand”. Of course, a pitch on prime time TV has got to help. Were the girls nervous when entering the Dragon’s Den? Hannah recounts: “it’s really funny, we were so relaxed the whole day. It was just as we went to walk in, it just hit you like ‘WOW this is it’. I do think there’s that element with Dragon’s Den that ‘oh it’s for TV, it’s entertainment’. But there are five people in that room waiting to hear about your business and your pitch and you as people. There’s a big pressure to really perform. We didn’t rehearse anything off. We looked at it like it was an in-store tasting we’re explaining this product to people in the most simple manner for both the Dragons and the audience at home”. And their plan had all the successful ingredients necessary to secure the funding. However, securing the right expertise was also crucial for our budding entrepreneurs. “We’re recent graduates and as much energy, enthusiasm and passion that we have for this product and company, we are looking for the expertise”, adds Hannah. In relation to packaging, the product does stand out. “You’ll see that ‘own brand’ flavoured butters are pads of butter or disks of butter. We made a conscious decision quite a while ago to keep Improper Butter as a block, a very miniature replica of your proper Irish creamery butter is where it comes from. We feel it inspires creativity. Once you give people a couple of suggestions like ‘melt on your steak, stir through soup, stir through pasta’ then people start to come back to you and say ‘oh I stuffed that into a chicken fillet and wrapped parma ham around it and it was just delicious’. It’s brilliant. We love it when people take ownership and use their own creativity with the butters”, beams a proud Hannah. The duo are currently working with a new creative agency and are very excited about building on their brand and to linking their social media offering with their current website to set a clear voice and tone which are all linked to the product offering. As to their target market, well, it is multifaceted – working mums, mums working in the home, young professionals and even the empty nesters “looking for convenience and quality and then there are also young professionals who are looking for a good quality food really quickly”, says Hannah. “It’s wide, it’s naïve to just say everyone but it is a simple product and it’s a simple concept. Everyone is time starved and we’re providing a solution to that problem. There’s the convenience element of the product but it’s the quality of the product, you’re enhancing dinner massively”, she adds. It is obvious the girls love what they do and they execute it with passion but what business model or brand would they like to emulate? “We always look at Innocent and I think a lot of companies look to Innocent as the benchmark because they just do everything brilliantly. They were the first smoothie but they executed it superbly. There are a lot of companies that try to copy Innocent; we don’t want to copy any company – we don’t copy. However, we would look up to them, they revolutionised the market. At the moment the Saucy Fish Company are really interesting for us”, cites Elaine. It is clear that these two young entrepreneurs have bags of energy and enthusiasm to build a brand of worth. As I leave their premises in Spade Enterprise Centre near Dublin’s bustling Smithfield market, I ponder the thought – steak with Cashel Blue or grilled prawns with Garlic, Flat leaf Parsley and Lemon – The choice is simply Improper! On digging deep for an answer, our duo admitted one big difference between them: Elaine will always postpone gratification and Hannah will never postpone it! – Food consultant James Burke has helped our duo since launching the business as part of the Local Enterprise Office initiative. – Family is great to bounce ideas off and according to the girls: ‘are so honest, they are brutally honest’! YOUR WISHES IF YOU HAD A BLANK CHEQUE? – Fast track our branding – at the moment there’s only so much time. Have a TV ad for example. – Launch new ranges other than butter. – Pay ourselves money [to get our phone bill paid and even treat ourselves to a gym membership].